A Response to Martin McKee which the BMJ won’t publish.. This is the second article  I have read today in which McKee attempts to conflate the e-cigarette industry, libertarian bloggers and angry e-cigarette consumers (vapers) in an attempt to paint the latter group as an astroturf organisation in the pay of either big tobacco or big vapour, which of course to his mind are one and the same thing. Is it any wonder that people who do not have the luxury of being published in prestigious journals such as this get even more angry when being maligned in one? Either McKee does not understand the public he purports to protect or his comments are disingenuous in the extreme. I know that McKee has read Clive Bates’ blog article entitled ‘Memo to public health grandees: vaping, vapers and you’  which attracted 111 positive comments from consumers and is the most read and shared article on the Counterfactual site. I personally asked McKee to read that article because Bates has absolutely nailed the thoughts and feelings of vapers on the head, as is evident from the comments. My request to McKee to read it was a genuine attempt to create some understanding between our two sides. He confirmed that he’d read it, but the message appears to have fallen on deaf ears. McKee is completely entrenched and out of touch. He is of course free to disagree with Bates’ article, but cannot deny the fact that it has the widespread support of the very people who are its subject. McKee has himself researched a member of the public and indeed uncovered the shocking fact that one Twitter user (who uses his own name and very colourful language) is a freelance writer who sometimes gets paid to write positive articles about e-cigarettes. If he’d researched further he may also have found that this is common knowledge, as is the fact that the person is a British ex soldier with several tours of duty under his belt, which probably explains the liberal use of creative profanities. One, sometimes foul mouthed, squaddie with a genuinely held belief that public health will kill people doth not an astroturf lobby make. There appears to be a concerted effort by some in public health to deliberately make false associations between a genuine grass roots consumer campaign and organisations with commercial interests, the more malign the better. This of course serves two purposes, firstly, it undermines the voice and views of the public by instilling the false belief that their views are paid for rather than their own. Secondly, it allows those in public health who are apparently unable to control their own behaviour to keep their jobs due to “mitigating circumstances” – those circumstances presumably being that they were baited into calling members of the public “c**ts” and “onanists” by industry shills with agendas . One thing is for sure – if McKee and others continue to provoke vapers with false accusations whilst failing to engage with them on the issues which are important to them, the relationship between the two sides is only going to get worse, and PH will only have themselves to blame. If your job is public health and you find that the public are angry with you then you really should be asking yourself a question – and here’s a clue – it’s not “who is paying them”. It’s been a long time since I was at school, but I still remember the feelings of humiliation when it was my turn to be picked on by the school bullies. The bullies were kids a little older than me, and their MO was to choose someone to be singled out for ridicule for the day, normally on the basis of the way they looked, or what they were wearing, or simply because they didn’t fit in very well. I am embarrassed to say that I also remember the feeling of relief when it was someone else’s turn, and how I would offer the victim no support at all, for fear of finding myself in their shoes the next day. 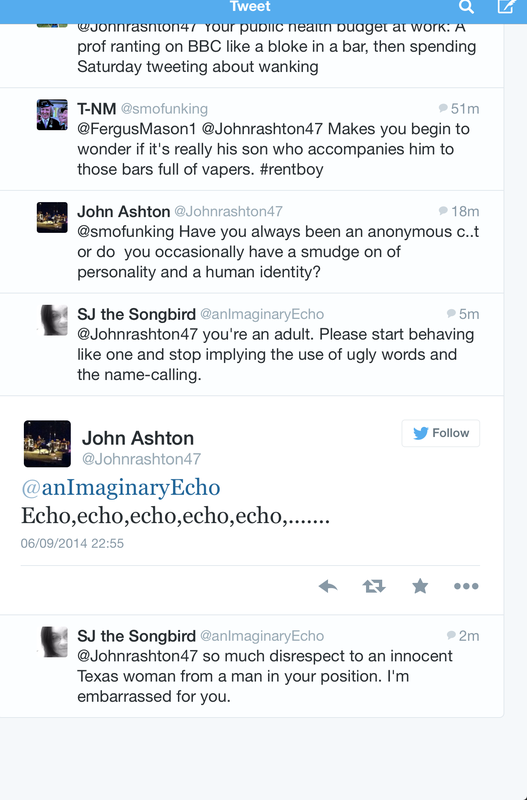 The bullying wasn’t abusive or even particularly overt. A look here, a pointed finger there, things only half heard emerging from a huddle of whispering gossips. The tangible effect of all this however was the sense of exclusion and isolation it creates. Bullying has no effect unless not only the victim knows they’re being bullied but other people know it too. 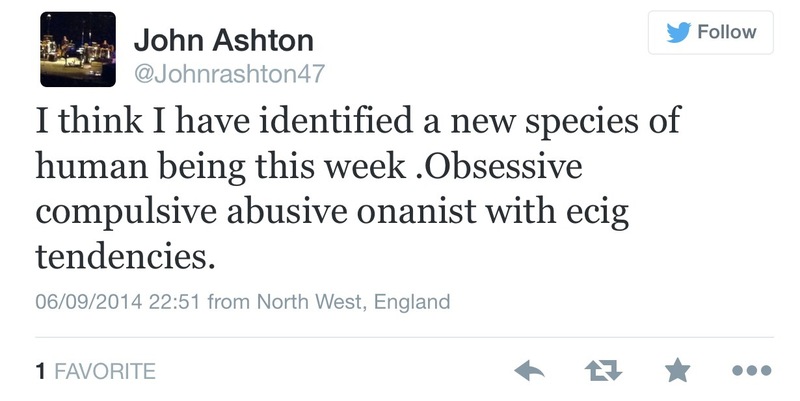 The aim is to to render the victim a social pariah, friendless and thus more vulnerable to attack. Tobacco control has been doing this to smokers for years, and never more so than now. Social media is the new playground and these groups have taken to it like ducks to water. 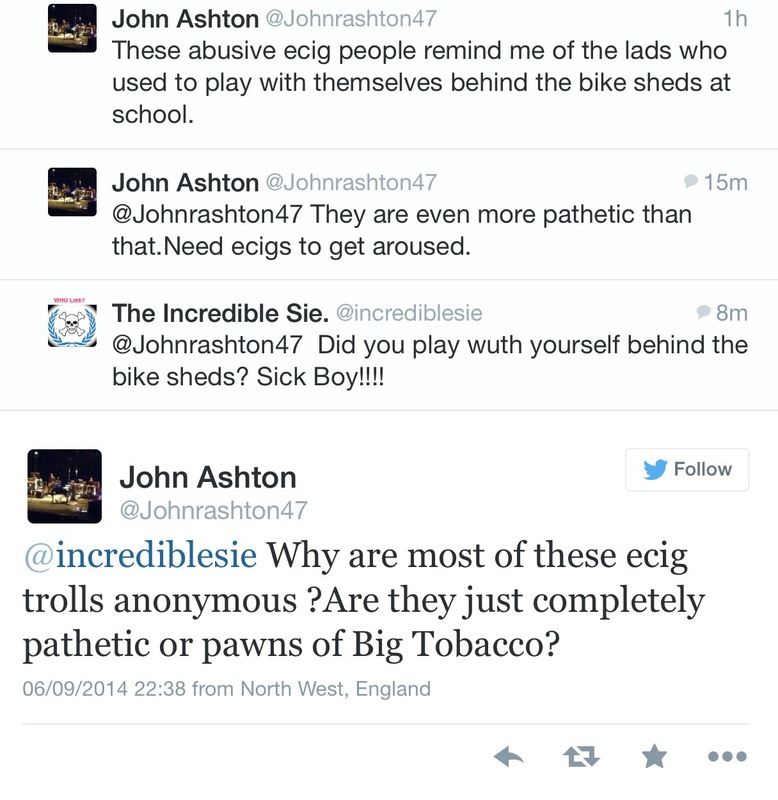 Take a look at ASH Wales #sharetheair Twitter campaign for a mild example, or any of the extremist US anti smoker groups if you need further confirmation. Full of smug arrogance and tax payers money they wield their influence sure in the knowledge that the sheeple will support them based on the exaggeration and distortions of the past. 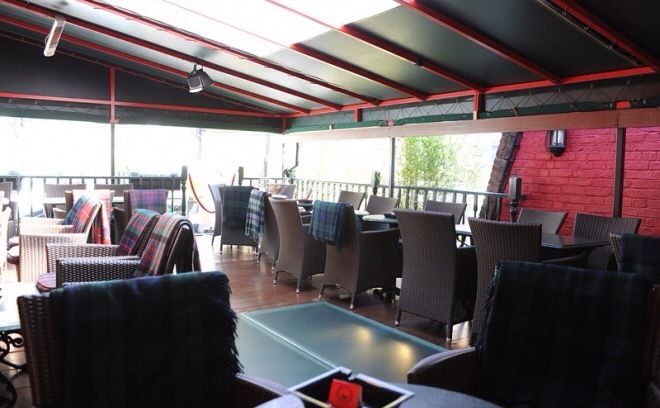 And they don’t give a second thought to the people they are insulting, excluding and stigmatising – the smokers. It’s never a good day in a bully’s life when his victims group together and fight back. It’s an even worse day when some of his own supporters turn their backs, either because they’ve seen that they are wrong, or because they realise they’ve bitten off more than they can chew. 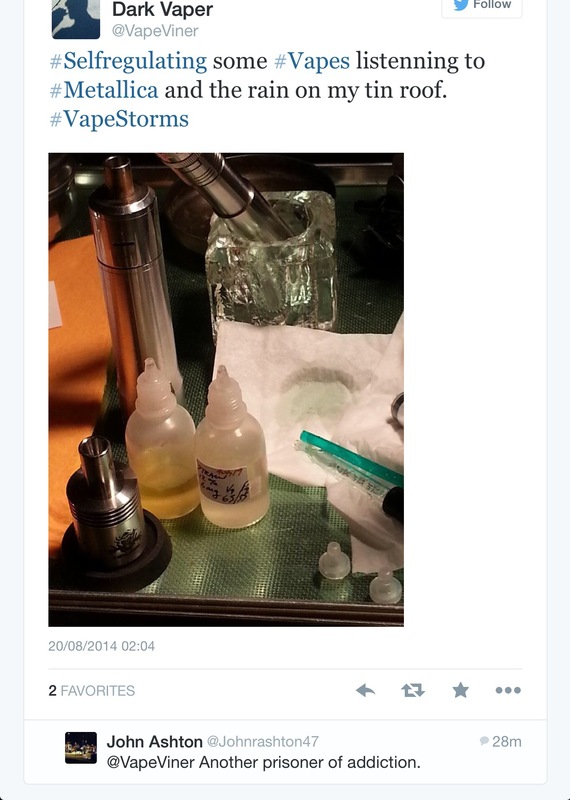 Vapers are fighting back. We’ve been the victims once and we’re sure as hell not putting up with it again. So we also take to social media in order to get our voices heard on the same platform. But we do have to be careful. We have right on our side but we need support from right thinking academics, the media and the general public. We will not get (or keep) that support if we become something with which decent people do not want to be associated. In short, we will lose if we become the playground bullies. The public loves a victim. Banter is a natural release, a way of blowing off steam. It’s also a part of what keeps us together and motivated. But we shouldn’t forget that some of the targets of our lighthearted comments are not as thick skinned as we think they are. Sometimes just the sheer number of comments can be intimidating, even if none of them are abusive. What appears to us as a bit of a laugh, or simply fair comment becomes something else when it is continually picked at like a scab, just as it did with those kids in the playground commenting on my poor choice of footwear. It can become bullying in itself. 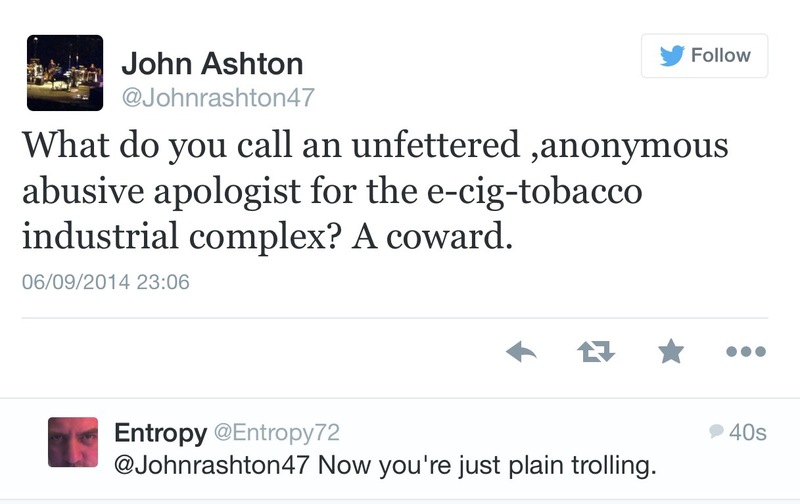 It’s only fair that I should post the apology made on Twitter by Professor John Ashton just a few minutes ago. 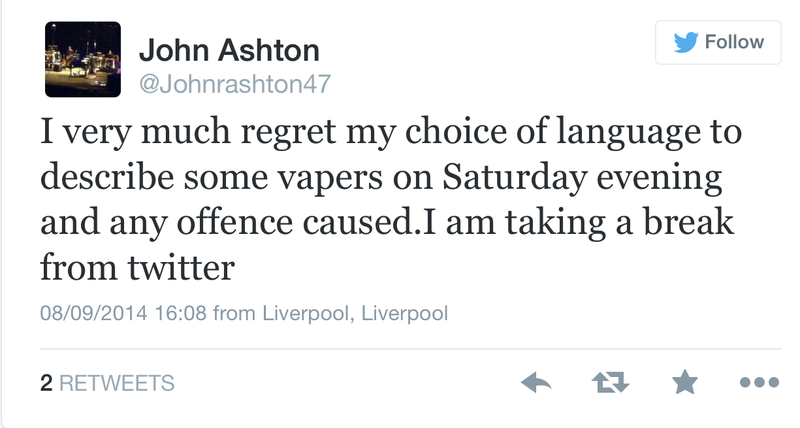 Whilst John Ashton has apologised for the choice of language he used on Saturday night, he makes no effort to explain, much less apologise for the prejudiced thinking that underlies his choice of words. Well he can’t really can he, a bigot is a bigot no matter how polite the actual words used may be. Wow what a day..I bet you’re really pleased with how it went eh? I mean, what fun to turn the release of your normally-oh-so-very-boring paperwork into a full scale attack on the health choices of such a large number of people. 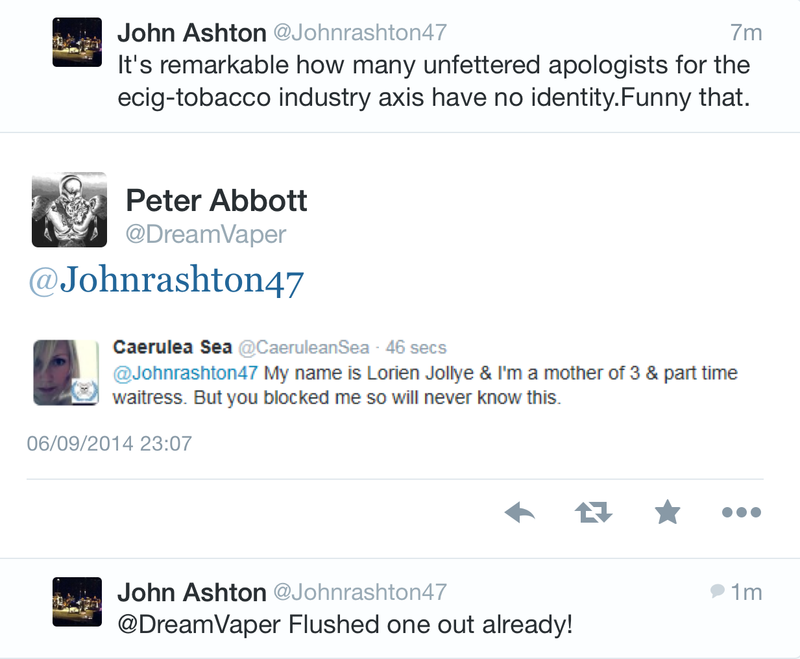 And didn’t they bite back – well you knew they would – vapers always do, right? Anything to get those clicks..
What you don’t realise is that our anger is real. I doubt there’s a single vaper in the twittersphere who won’t be able to get around any and all regulation which the governments you seek to influence try to throw at them. But you see, they don’t do it for themselves – they do it for those who will follow them. And for those who are currently vaping but don’t have the knowledge to get around your unethical dogma. And they see you for what you are – a seething mass of gravy train style corruption and a complete and utter disgrace. Whether or not the government signatories to the FCTC take up your recommendations on ENDS as you call them is now almost immaterial. The damage you did today was immense, and will be far reaching. I’d love to quantify that in lives ruined and lost, but well, I’ll leave the junk epidemiology up to you. You seem to have a penchant for it. I won’t ever forgive you for what you did today. I hope you’re proud.